Blogging What To Do If Someone Steals Content Of Your Blog? What To Do If Someone Steals Content Of Your Blog? Things like fraud, cheating and stealing not only exist in the offline world but they also have a huge existence in online world. Like in offline world lots of people steals ideas, logos and content of other people similarly there are people who steals content from blogs of other people and then publish it on their own blogs. There are different types of content theft like stealing of articles, photos, videos. a blogger works hard to write a article for several hours while a content thief simply copies the article and pastes it on his own website. When a person sees his hard work of hours copied by another site then its really sad moment for him. If you want to use content of someone else on your site then give proper credit to real owner with his link otherwise its stealing. So what you can do if someone steals your content? 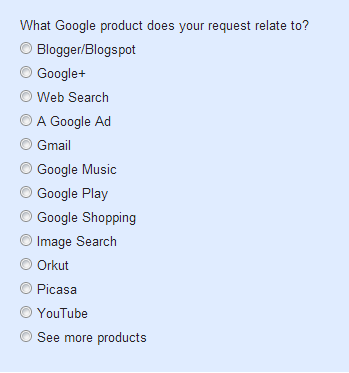 the best solution is that you can file a DMCA complaint to Google against the site on which you find your content. as the Web is growing with time the content theft is also increasing so Google is taking various steps to cope with it and DMCA complaint is also a part of this. Simply go to this link and choose the service on which your copyright violation is done. If you will choose the web search then Google will remove the link that is having your copyrighted content from Google search. If the site that is copying your content is hosted on blogspot then Google will remove that post from the blog because Blogger is owned by Google itself. In some cases Google can even remove the entire blogger blog for a copyright complaint specially if the party that is filing the complaint is a big one. If your copyrighted video is uploaded by someone on Youtube then choose Youtube and Google will take down that Video from Youtube. You will have to mention your content link and link of the content where violation of your copyrighted content is done. Google will take down the content that is doing copyright violation in 48 hours. however you should file a dmca complaint only if someone is really violating your copyrights. remember that other party can also file a counter complaint against you if you filed a false dmca complaint that can lead to legal action. the good news is that Google has recently made DMCA complaints against any website one of the factor for its Ranking in Google Search. So the more DMCA complaints that will be filed against a site the more it will rank lower in Google. secondly Google's Algorithm updates like Panda has also greatly helped to give lower Rankings to copied content. a famous Cricket live streaming website khantv.com was completely removed from Google Search because many TV channels filed DMCA complaints against it for showing Cricket matches Streaming Illegally. So you should continue to work hard on creating unique and quality content and if someone steals your content then file a DMCA Compliant Immediately against that site. once you done it Google will settle the things for you and your hard work will remain saved.